Buy Surri Small Automatic Walnut cracker/walnut cracking machine - Shandong Leader Machinery Co.,ltd. 2. First connecting the power line rightly, then install the charging plate and chute. Otherwise, wrong running direction of the machine will damage the charging chute. Put walnuts in the charing plate, open the charing switch (red boat-shape swith), making sure the switch is in half-wave place, adjust the setting knob, when the walnut can outflow along the charging chute to the chain, press the green round switch, now the machine can start working. Att: charging frequency close to the working speed of the machine is ok. If you require larger breaking fissure, adjust the M10 screw on the top of the machine, anticlockwise, breaking volume will be larger, conversely, smaller. If the walnut is too hard, backward the heavy hammer behind the flexible pressure head, until the effect is good enough. 1. Put a little cooking oil in the mobile part everyday, open the rear cover of the machine every half month, put some new calcium base grease. 2. If the machine needs to be repaired, do not start up the machine directly after repair. First, open the air shroud of the motor rear cover, stir the fan blade by hand, make sure the running direction is right, then start up the machine. 3. 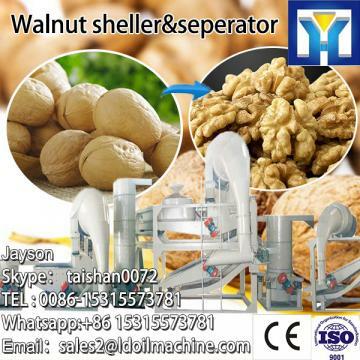 The normal charging chute of the machine applies to walnut within 3-4.5cm diameter. If you need process larger or smaller walnut in large volume, customized charging chute is needed. For the whole Surri Small Automatic Walnut cracker/walnut cracking machine,warranty is 12 months,within 12 months,if have equipment quality problems,we will provide accessories freely. After the expiration of the warranty period,if have spare parts problem,we only receive the cost of required replacement parts.We commit we will provide free technical support of equipment all whole life. Our company has engaged in producing and exporting Surri Small Automatic Walnut cracker/walnut cracking machine for many years, and until now, our machine has exported to overseas market, such as Brazil, India, Indonesia, Russia, Thailand and so on, and get the foreign customers' unanimous praise. We believe that you purchase Shandong Leader Machinery Co.,ltd. Surri Small Automatic Walnut cracker/walnut cracking machine is your best and sensible choice.